With over 25 years experience supplying and installing tracking devices Trackerfit are number one for car trackers Midlands. Over 1 million car crimes are reported every month and with thieves willing to go to extreme lengths to get their hands on your most prized possession the need to protect your vehicle is greater than ever. 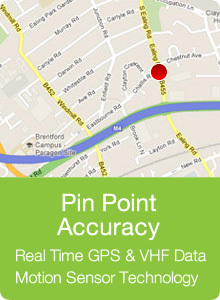 As a leading supplier of car trackers Midlands our range of tracking devices is second to none. Feature rich, a tracking device is the perfect way to protect your vehicle from any potential thieves, and it could prove to be the difference between finding your vehicle and never seeing it again should the unthinkable happen. Equipped with the latest GPS, GSM and VHF tracking technology you’ll be able to keep a close eye on your vehicle at all times, even if it has been taken by thieves. A vehicle fitted with a tracking device can be located to within 10 meters of its location! Many of the car trackers we supply here at Trackerfit are equipped with sophisticated motion sensing technology, cleverly detecting any illegal movement of your vehicle. This helps reduce the risk of your car falling victim to tow away theft, a common tactic used by the modern day thief. Assisting in the recovery of your stolen vehicle we have a number of manned control centres up and down the country. Working 24 hours a day 7 days a week and liaising with the relevant police force we have a track record for returning stolen vehicles within an hour of the crime being reported. So when you opt for car tracker you can have peace of mind knowing your vehicle is protected both day and night. Although the initial price of a tracking device may seem a little pricey over time it will pay for itself. Most tracking devices are approved by major insurance companies, therefore you’ll save money on your insurance premiums. Installation of all our products is free of charge and conducted at a location of your choice. Along with all our products all our engineers are Thatcham approved therefore you can guarantee the service you’, another reason why we are a leading supplier of car trackers Midlands. So if you’re looking for car trackers Midlands and require further information on any of our products then don’t hesitate to get in touch. Give us a call on 0121 295 1474 to speak to one of our experienced technicians for expert advice.